That lyric serves as a poetic outline to this work of art. Part the Second invokes beautiful imagery with its ability to set the listener in a place of elemental dominion. Whether it is the music or lyrics on this album, I can't help but see myself on an island experiencing life in a totally new way. That's the power of Part the Second, it moves you. 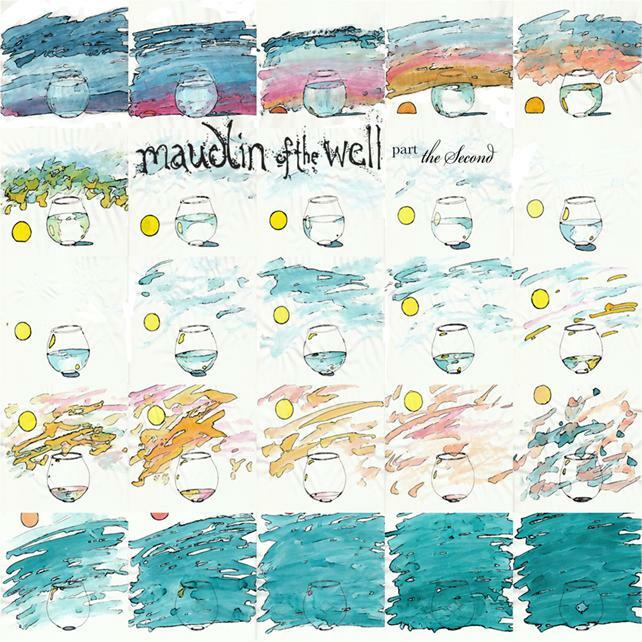 Maudlin of the Well somehow both embarked on a new journey with this album as well as bringing another to a close. Previously unleashing the albums Leaving the Body Map and Bath, Maudlin of the Well were artistically established and were hitting their crest. But as shown with this release and the unpredictable evolutions that Kayo Dot would go on to experience, Toby Driver likes to progress, change, and experiment. This album would mark the end of the powerful Maudlin entity, giving the band another chance to blow listeners away, as well as signal the creation of the soon masterful Kayo Dot. As on albums before, Toby Driver effortlessly weaves styles and genres together to make unique compositions and give Part the Second a harmonious identity of its own. Though you won't hear lengthy metal passages, growling, and the like the heavier influences still reside on this album, they're simply reined in a bit and are used as equally beautiful contrasts and turning points to the orchestral rock music found flowing throughout Part the Second. And like an orchestral piece, I feel this is one of those few albums that must be listened as a whole. While the songs don't so much flow together obviously, the emotions and recurring themes and sounds just build upon each other and just have a much stronger impact when you hear how the album dances and sings as a single piece of music. The instrumentation on Part the Second is flawless. The violin and guitars that lead on this album are evocative, melodic, dark, inspiring, and interesting. You'll hear the mastery that is expected of progressive music. Drums illustrate and match the mood of every piece, giving the music the jolt it sometimes requires when the guitar takes a step forward, or being weightless when the violin cries and the music is more orchestral. The additional instruments including piano, flutes, and cello give Maudlin of the Well a wider arrangement of textures and touches to brighten the music. It's thanks to this kind of instrumentation that the music here has such an elemental feeling to it. All the compositions and structures can be easily compared to that of a stormy night, a relaxing sunrise, a cold rain, an August fire, anything. Part the Second becomes your own personal canvas. A personal part of Toby Driver that I absolutely love and find sometimes overlooked, is his lyricism. Wonderfully poetic, Toby Driver's lyrics on this album enrich the music because of the similarities they share. Being focused on the natural world and the supernatural experiences with it, the relationship between the lyrics and music shine not in a parasitic way, where one dominates and relies on each other but rather a beneficial symbiosis. The vocals are sung with emotion and conviction. They sometimes are intimate and quiet as they speak to you or they can echo with an eerie pride. The strengths and balance of these parties elevates each other and add the journey of Part the Second's imagery. All in all, Part the Second is not something that a Toby Driver fan should hear, a post-metal fan should hear, a progressive music fan should hear, no ' it is an album that any music fan should hear. Imagination and brilliant execution to back it up, Part the Second is a auditory experience that will bleed into every other sense.